Ciminelli's office in St. Petersburg represents an extensive selection of commercial real estate properties along Florida's Gulf Coast. We have retail space, office space, and vacant lots that area available for both sale and lease. Though we operate in four states, the Ciminelli name is backed by generations of a customer focused philosophy and years of quality service to all our Florida clients. Below is a listing of our properties currently featured in St. Petersburg. For a complete listing, please visit our portfolio page. Ideal User Purchase Opportunity! 9,900 sf standalone retail building (formerly Family Dollar) in St. Petersburg, FL. High exposure with building and pylon signage and 322' of frontage on 18th Avenue. The property sits within a 3 mile radius of 92,0000+ residents contributing to the strong urban location. Conveniently located less than 5 minutes from/to I-275, 1.7 miles from Bayfront Heath, and 1.8 miles from The University of South Florida St Petersburg. Within minutes of Tropicana Field and downtown St Petersburg. Property Size: 9,900 Sq. Ft.
Min. Contiguous Space: 9,900 Sq. Ft.
Max. Contiguous Space: 9,900 Sq. Ft. The 16 story professional office tower is located between Beach Drive and 1st Street N. This location offers fabulous views of Tampa Bay, a wide variety of restaurants and numerous upscale shops. Additional amenities includes: a coffee shop, numerous restaurants in the courtyard, beauty salon, gift shops, florist, ladies shoes and clothing. This property is adjacent to the new Sundial St. Pete Shopping District and has recently upgraded fiber optic capacity. Building Size: 147,533 Sq. Ft.
Min. Contiguous Space: 1,208 Sq. Ft.
Max. Contiguous Space: 11,146 Sq. 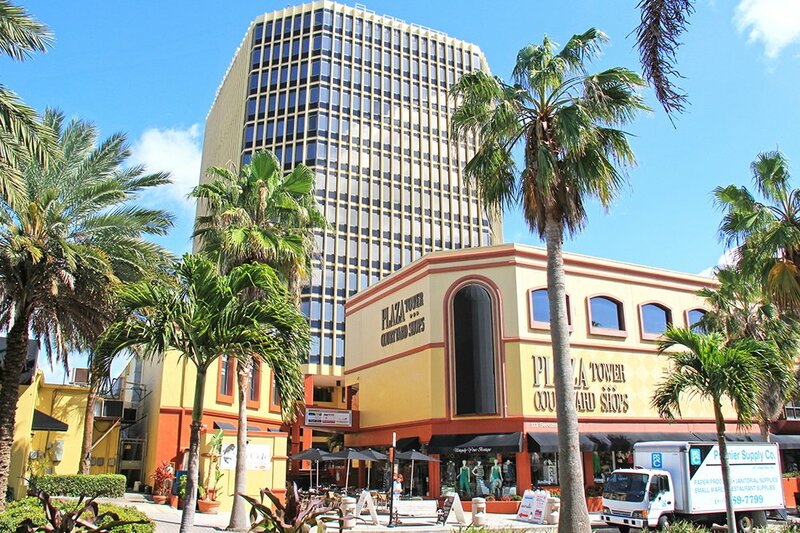 Ft.
Plaza Tower & Courtyard Shops is located between Beach Drive and 1st Street N in the heart of Downtown St Petersburg. This location provides the ideal image for your business. Excellent street visibility with heavy car and foot traffic. Attached parking garage with reserved parking available. Shops surround an attractive courtyard with a 16-story office building on site. Ideally located adjacent to the new Sundial St. Pete Shopping District. Walking distance to Straub Park and minutes from I-275. Building Size: 39,288 Sq. Ft.
Min. Contiguous Space: 674 Sq. Ft.
Max. Contiguous Space: 11,299 Sq. Ft.